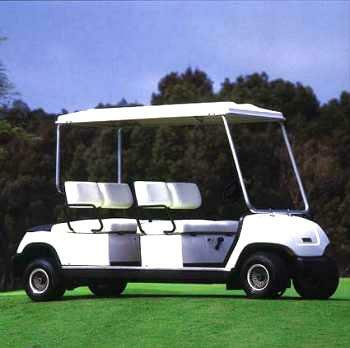 Yamaha burst onto the golf car scene in 1978 with a gas car that re-defined the gas golf car. At the time, Harley Davidson (AMF) and E-Z-GO claimed most of the market share. 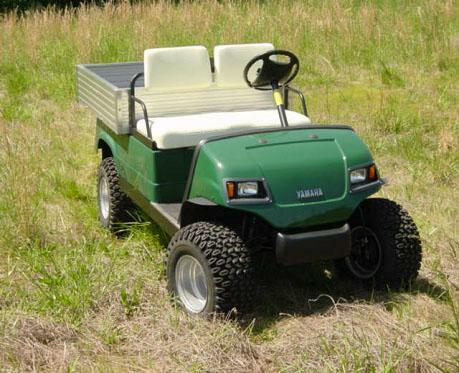 Club Car was not even thinking about gas golf cars. 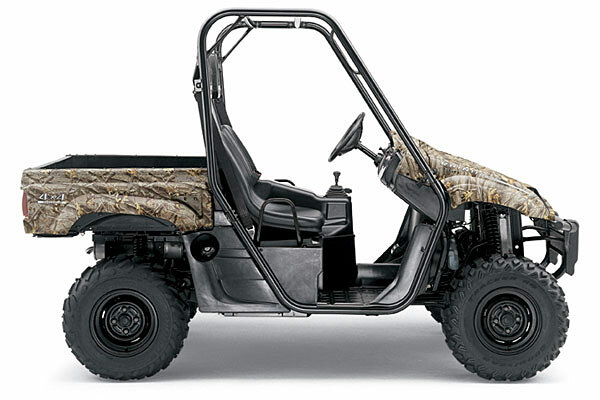 Yamaha produced a gas engine & drive train that actually accelerated up hills instead of struggling to carry the load. Originally all the vehicles were produced in Japan but that changed when they built a new facility in Noonan, Georgia in the mid 80’s. 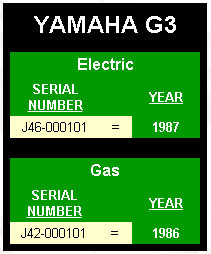 Initially the Yamaha G1 2-cycle gas (or 36 volt electric) was their standard bearer but in 1985 the G2 4-cycle, single cylinder gas (or 36 volt electric) became the new model. 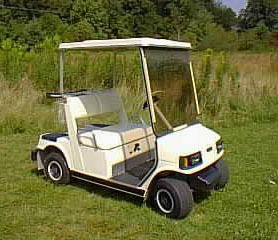 In 1986, Yamaha introduced the Sun Classic (or G3) with a 2-cycle engine or 36 volt electric system. 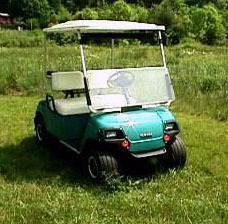 This was the very first customized golf vehicle with an integral roof and tempered glass windshield complete with a wiper. A front trunk, headlights, custom dash, turn signals and lots more were standard equipment. The G3 was later replaced by a very similar but larger G5 Sun Classic. Read more about these unique cars on our next page. The G2 model became the G9 model in 1991 and in 1995 the entire line was replaced by the G14. The G14 had a complete body design overhaul which moved away from the boxy look and into the rounder, curvier body style seen today. The G14 was short lived and soon replaced by the G16 and G19 models which looked identical to the G14 but had substantial changes under the hood. The G1 was introduced in 1978 and production was discontinued in 1989. The vehicle has bucket seats and the entire rear body (and top assembly, if equipped) lifts back to reveal the drive train. 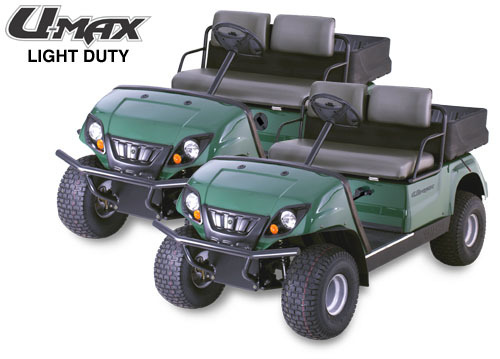 The G1 is powered by either a 2 cycle gas engine with an oil injection system or by a 36 volt electric motor & six batteries. The G1 body composition & gas engine underwent several modifications over the 11 years of production. The different designs (and year of manufacture) are identified by the serial number and its prefix. 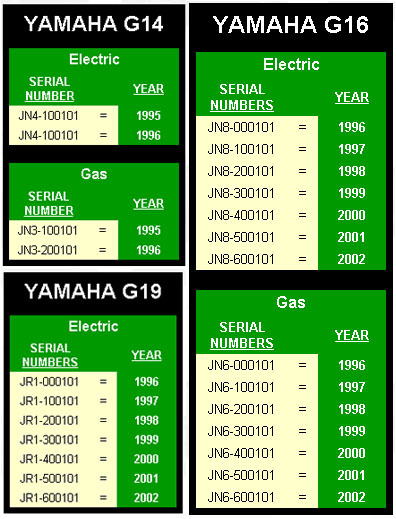 The original ‘J10’ model is followed by the ‘J17’, the ‘J24’ and finally the ‘J31’ model. The engines and bodies stayed very similar throughout the G1 model design. 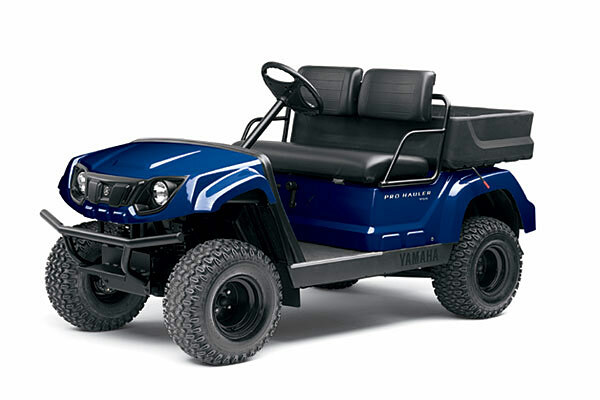 The Yamaha G1 golf car never had a standard ‘factory’ top assembly. Across the US, several aftermarket top manufacturers provided what tops there are and it is a hodge-podge to say the least. If you wish to purchase a Windshield and/or Rain Curtain for the G1, it is imperative that you know which company made your top. We will get into the various top makers and their designs later on. Look under the rear bumper, just below where the Bumper Mount Bracket bolts onto the cross member of the car frame. The number is stamped into the metal and must be viewed from the rear. 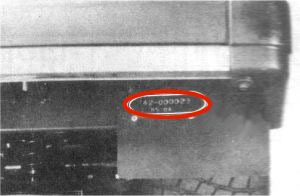 Depending on the specific year the serial number might be on either side of the frame cross member. Take a damp rag and a flashlight to help see the numbers. (Hey, I never said it would be easy.) 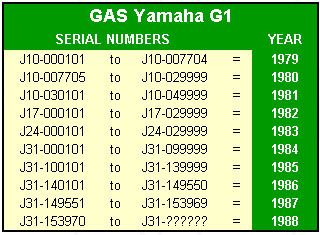 You will see the ‘Jxx – plus 6 numbers’, for example, ‘J10-000123. If the frame has much rust the serial number may be obscured. 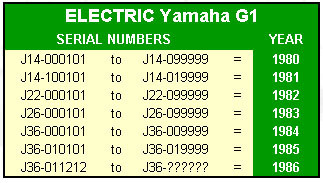 The Yamaha G2 was introduced in 1985, coincidentally with the G1 model and production was ended in 1991. The G9 model came out in 1991 as the successor to the G2. Both models sported a single cylinder 4 cycle gas engine or a 36 volt, resistor style electric version. 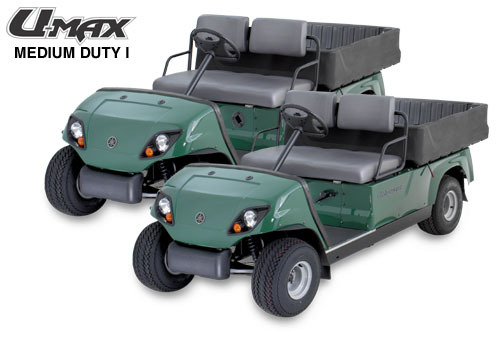 The G2 is distinguished by a ‘boxier’ look, a bench seat with 2 individual backs and a large covered dash compartment. The seat hinges forward to reveal the engine (or electric motor). The seat release lever is located under the gas cap lid (or charger receptacle lid) located just behind passenger side seat bottom. 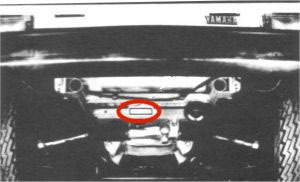 The later G9 model is a virtual clone of the G2 except the G9 has a band of rubber trim around the dash compartment instead of the aluminum trim found on the G2 model. The serial number has a prefix that designates the model, starting with a ‘J’ followed by 1 more letter and 1 number, or just 2 numbers. Following the prefix is a six digit extension. The serial number does NOT indicate the year of manufacture. You need all of these numbers and letters to assure that the correct parts are sent. The early model G2 has the serial number under the rear bumper, toward the passenger side. It is stamped into the square tubular frame that the bumper bolts on to. The gas cars will have a ‘J38’ prefix and the electric cars will have a ‘J41’ prefix (i.e. J38-000204). I suggest a flashlight and damp rag to help find the number. 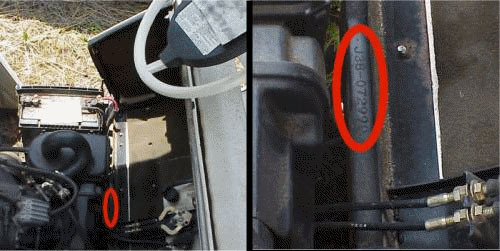 In 1988 the serial number moved to the very rear edge of the floorboard, just behind the back edge of the mat, under the seat pedestal in the engine compartment. The number is a little easier to find in this location. The G9 models started in 1991 with the prefix ‘JG5’, also found under the seat pedestal. The Yamaha Sun Classic models were designs far ahead of their time. Standard equipment included head, tail & brake lights with turn indicators, cushy adjustable bucket seats, front trunk and locking glove box, Macpherson strut front suspension, integrated top with an automotive windshield and chrome wheels with white wall tires. The design presaged the popularity of the Neighborhood Electric Vehicle. 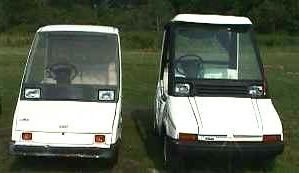 The earlier model G3 Sun Classic is on the left. 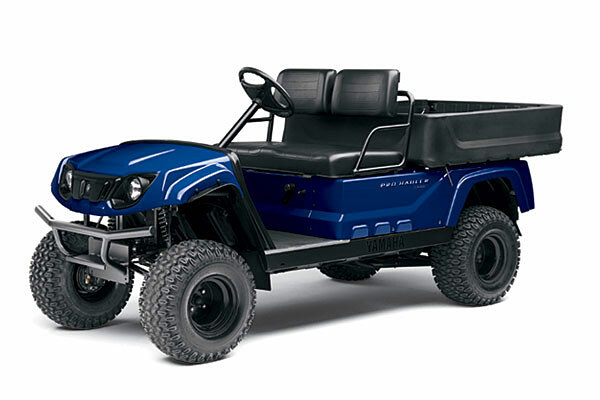 It has either a 2 cycle gas engine or a 36 volt electric motor. These are the same power plants as found in the Yamaha G1 cars. The later model G5 Sun Classic is on the right. It was first produced in 1992 and is equipped with a 4 cycle gas engine or with a 36 volt electric motor, the same as the G2/G9 models. The G5 has a much larger interior and an overhead ventilation system. Otherwise the cars look very similar to the casual observer. 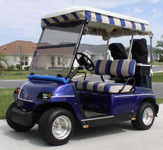 The serial number on the Yamaha G3 Sun Classic model golf cart is typically located just under the rear bumper on the passenger’s side. It is stamped onto a metal tag which is generally riveted to the frame. 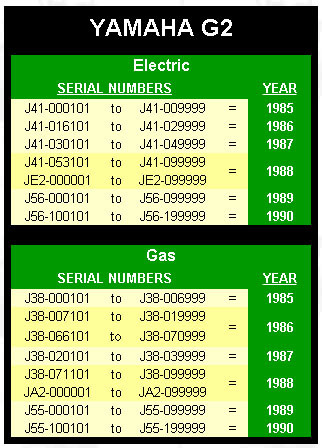 It should begin with either a “J46” prefix for electric models, and a “J42” prefix for gas models. See below. 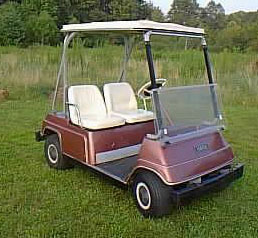 The serial number on a Yamaha G5 Sun Classic model golf cart is typically located on the front of the vehicle, underneath the cart on the main cross member of the forward frame. It is also stamped into a tag which is riveted to the frame. See chart below for year specifics. 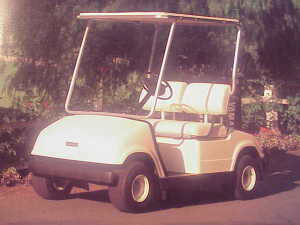 The Yamaha G8 is an upscale version of the fleet model G9, another golf car model Yamaha offered during the same years. The G8 came out in 1990 and it sported a curvier front cowl and rear fenders. It also has a long, full front bumper (side to side) and the seat bottom can be completely removed from the car, whereas the G9 (and G2) seat bottom remains fixed to the seat pedestal and cannot be easily removed from the car. The dash compartment interiors and dash trim are black. The G8 was put to pasture in ’94 but the frame and drive train may be seen converted into a G14 body. Kits are available to install the body panels of the later model G14. 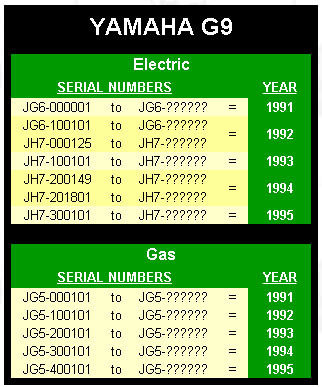 The 4 cycle gas version has the serial number prefix ‘JF2’ and the 36 volt electric model has the prefix ‘JF3’. 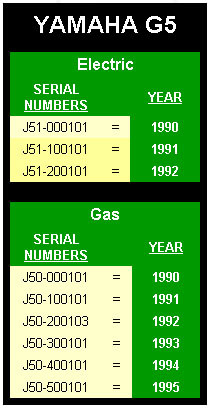 1990 started the six digit number with 000, 1991 started with 100, 1992 with 200 and so on until 1994. These models represent the most recent body design Yamaha has offered. The thermoplastic body is painted and clear coated. The G14 version came with either a single cylinder, 4 cycle, 300cc overhead valve gas engine or a 36 volt electric motor. The G16 came out a few years later and became the replacement for the G14 gas & electric model. 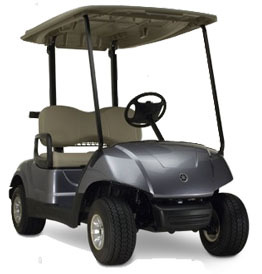 The G19 is offered only as a 48 volt electric regenerative braking system. All three versions sport the very same body design. The factory top assembly is pictured. 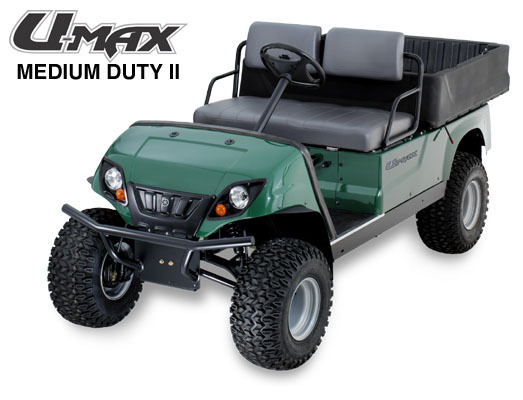 This entry was posted in Golf Cart Museum and tagged pro hauler, umax, yamaha, Yamaha Drive, yamaha g1, yamaha g11, yamaha g14, yamaha g16, yamaha g19, yamaha g2, yamaha g21, yamaha g22, yamaha g29, yamaha g3, yamaha g5, yamaha g8, yamaha g9, yamaha gmax, yamaha golf carts, yamaha rhino, yamaha sun classic by Michael Williams. Bookmark the permalink. Either one of two things is happening. Either too much oil has been filled into the engine of the amount of oil has increased. The amount of oil actually doesn’t increase, but the volume of fluid in the engine can. If you have a faulty fuel pump or a faulty carburetor which is not shutting down completely either via the needle / seat or a float issue, then too much fuel can end up in the engine. Ultimately, this gets down into the bottom end with the oil and it will increase the volume although it is then an oil/fuel mixture. More than likely, the second scenario is true.